I walked up Tottenham Court Road and thought I could smell potatoes cooking, but instead it was just a bus-stop. 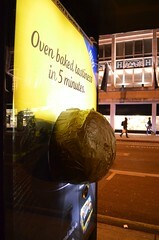 The bus-stop had a giant plastic potato protruding from it and I placed my hands on the potato and found it to be warm. Pressing the button on the bus-stop made a voucher appear and the potato smell got stronger, as potato scent was squirted into the air. Please buy our fake smelling plastic potatoes. There weren't actually any potatoes to buy!